It is replaced by the Symbol MC50. Symbol Technologies has maximized efficiency functionality and productivity in a new pocket-sized Palm Powered device the SPT 1550. Equipped with the latest processing technology and features the SPT 1550 is a powerful productivity tool enabling users to capture and manage data faster and easier than ever. The SPT 1550 is 100% compatible with Palm OS hardware and software and offers mobile professionals significant advantages with benefits in data capture information access and computing power. The SPT 1550 features an integrated scan engine and conveniently placed scan triggers enabling fast efficient and accurate data capture. 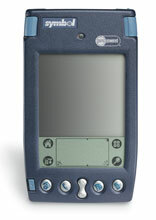 This is the smallest lightest and brightest engine available today enabling the SPT 1550 to deliver premium performance barcode scanning.The SPT 1550 comes with a generous 8 MB of RAM and 4 MB of ROM for application or data storage needs and its 33 MHz processor allows applications to run at peak speeds keeping pace with business demands. With its touch-based graphical interface push-button controls and backlit 160 x 160-pixel display the SPT 1550 is easy to use even outdoors or in dimly lit spaces. Two AAA batteries deliver hours of power or an optional rechargeable NiMH battery kit is available. The SPT 1550 supports both single and multi-slot cradles for flexible host communications in most network and user environments. SPT 1550 Complete Kit, Starter kit bundle for SPT1550-TRG80400 that includes the PDT and a communications cable. Symbol Technologies has maximized efficiency, functionality and productivity in a new pocket-sized Palm Poweredâ„¢ deviceâ€”the SPT 1550 . Equipped with the latest processing technology and features, the SPT 1550 is a powerful productivity tool, enabling users to capture and manage data faster and easier than ever. The SPT 1550 is 100% compatible with Palm OSÂ® hardware and software and offers mobile professionals significant advantages with benefits in data capture, information access and computing power. The SPT 1550 features an integrated scan engine and conveniently placed scan triggers, enabling fast, efficient, and accurate data capture. This is the smallest, lightest, and brightest engine available today, enabling the SPT 1550 to deliver premium performance barcode scanning. Salespeople can enter customer information, scan items from a bar-coded catalog and check downloaded price lists, enabling more time to sell and less time doing paperwork. With its laser scanning capability, the SPT 1550 can also help increase efficiency in the office, streamlining processes such as office supply ordering. Medical professionals can take advantage of the SPT 1550 's mobility, using the device for patient verification, bedside drug administration and a host of applications used hospital-wide. Teachers and education professionals can use the device to access and update student records, including daily attendance and grading. With its easy to use interface, consumers can also enjoy the benefits of scanning with the SPT 1550 . Instead of written shopping lists, consumers can scan items as they are depleted, creating an electronic shopping list. This electronic list can be used on the next shopping trip or uploaded over phone lines to the local store or e-commerce websites. Any business can tailor the adaptable SPT 1550 to boost the productivity of its mobile professionals. 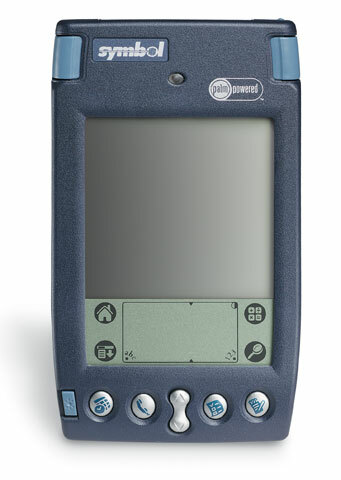 Because the device is based on the Palm platform, programmers can build solutions using familiar Palm OSÂ® development tools. To learn more about the SPT 1550 or our other innovative business solutions, contact us at any of the locations listed below or visit www.symbol.com.